For the past week I’ve been playing with a Nokia E66 generously provided by WOM World. Basically, it’s a business phone, and it’s like a slim N95, but with a 3.2 megapixel camera. The bad news is that this particular E66 is a Euro/Asian model (UMTS/HSDPA at 2100 MHz). The good news is that a US model is available (UMTS/HSDPA 1900/850 MHz). The camera is disappointing. The firmware is buggy, and the image is displayed upside down unless the phone is started and kept in offline mode! No fix is available for this yet (in fact the E66 is not even recognized by NSU). Furthermore, picture quality is low for a 3.2 megapixel camera with auto-focus, macro and flash. But beyond all this, I’m enjoying the device. 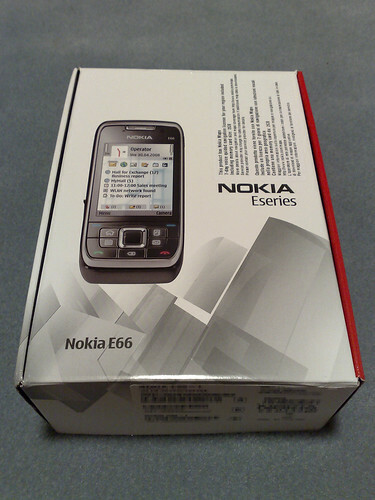 There are a number of interesting software improvements in the version of Symbian (S60v3 FP1) running on the E66.